Come Find Us At Our New Home! The holidays are fast approaching, which means it’s time to start thinking of great ideas to give that special romance novelist in your life. Instead of gifting them yet another mug printed with a clever writing-related quip, or a stack of blank notebooks (although, frankly, we can never get enough blank notebooks), try thinking outside the box this year. Here are a few fun, novel ideas to get you started. Subscription to Focus@Will. When we’re churning away at our novels, we need to block out the rest of the world and focus on nothing else but our words. Sometimes this can be hard to do, especially for those of us who fit our writing in among the chaos of day jobs and families. Something I’ve personally found helpful is Focus@Will, a music service that is specifically designed – and scientifically proven – to help improve concentration. You can give gift accounts in 3-month, 12-month, and lifetime intervals. Aqua Notes. Ask any author: the best ideas always come to us while we’re showering. Half the time, we’re running out of the bathroom, naked and covered in suds, eager to jot that brilliant plot point down on a soggy piece of paper before we lose it forever. With a pad of waterproof paper suction-cupped to the shower wall, though, we can capture our ideas while we’re still in the middle of shampooing our hair. 642 Things to Write About. We all have those days when the words just don’t flow as fluidly as we want (or need) them to. Sometimes, the best way to combat writer’s block is to write about something totally random and off-the-wall. Writing prompts are notorious for helping us out from our ruts, and a book with 642 of them provides almost two years’ worth of ideas – whether it’s brainstorming a new story or getting unstuck from a tricky plot point. Plot Your Work Planner. This is a new one, and still in a beta-testing round, but doesn’t it sound cool? Well, to the novelist in your life it might sound cool, even if it doesn’t to you. For authors who are juggling multiple projects at once, this planner helps them break down their massive monoliths into manageable chunks of work, scheduling their entire year with goals, focus items, and mind maps. As of this publication, they should be available for order during the first week of December, with plenty of time to ship before the holidays. Gift Certificate to The Ripped Bodice. We all need to refill our creative wells from time to time, and the best way for a romance novelist to do that is to read more romance novels! Give the writer in your life a gift to The Ripped Bodice, the only bookstore in the United States to focus exclusively on romance. They offer online-only gift codes, so even if you can’t make it to their brick-and-mortar storefront in LA, you can still indulge in the romance-y goodness available online. These are just a few creative ideas to help inspire your favorite romance novelists to write more and write better in 2017. Any ideas I left off? Feel free to leave them in the comments! Time for RWASD’s Literacy Event! Our November meeting was full of good cheer as we raised money for several San Diego literacy charities, enjoyed big name speakers, and handed out awards to some well deserving members. Our speakers this month were New York Times best selling author Julie Kagawa and agent and founder of Fuse Literary, Laurie McLean. During our morning session, Julie and Laurie talked about Making a Million Dollar Deal. Together they spoke of Julie’s journey from novice writer to bestseller, sharing hilarious and enlightening stories. Laurie pointed out that you can meet an agent anywhere and that it doesn’t have to happen in New York. Take advantage of your opportunities in San Diego. Also, don’t be disheartened if your first book doesn’t sell. Julie didn’t get her first deal until her second book. In the afternoon, we had a special Q&A session with Julie. (While Laurie took pitches from our authors!) Before she was a writer, Julie was a dog trainer, a vet tech, and a pet seller. She loves writing YA mainly because “I don’t like writing adults”and is lucky to have a very supportive family. She’s a pantser and finds her inspiration in The Hobbit, Lord of the Rings, and Terry Brooks. Her tips for writer’s block? 1. Power through and write crap. 2. Take a break and talk it through. And 3. Skip the hard part and write where you’re not stuck. And then there were awards! Our Barbara Faith award went to Lisa Kessler. Her smiling dedication to RWASD and all the wonderful workshops she has taught has made this chapter a better place to learn. 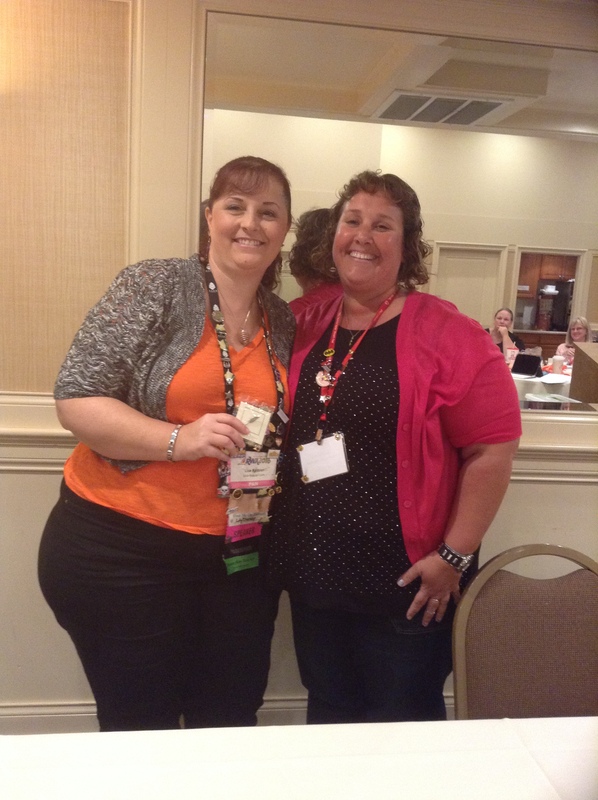 And our Member of The Year award went to our current chapter President, Tameri Etherton. Tameri has helped our chapter thrive with millions sparkles and a can do attitude, no matter what the adversity. Thank you both for you hard work and constant inspiration! And of course, our opportunity drawing was overflowing with goodies such as wine and chocolate baskets, Kindle Fires, and even full paid registration to the California Dreamin’ conference in 2017! Many thanks go to our fabulous event chairs, C.J. Corbin and Demi Hungerford who worked hard to make this event something special. They also made the beautiful themed center pieces for our tables! And what better way to end this recap than with some Good News! Demi Hungerford as four anthologies re-edited and re-published. Also all four in a yearbook. As usual, the Literacy Event was a highlight of our chapter year. Thank you for joining us and we hope to see you in December for our Holiday Potluck! Our chapter has grown quite a bit over the past couple of years. 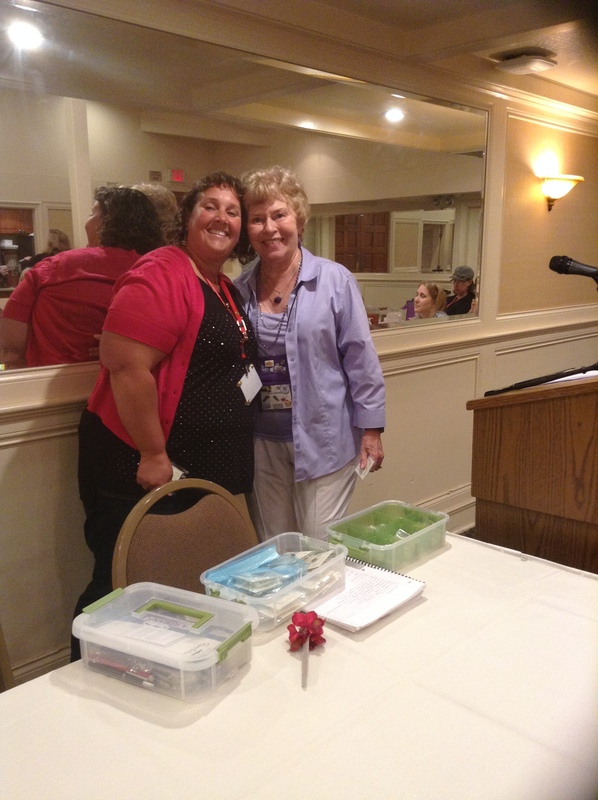 We love seeing new faces at our monthly meetings and getting to know new romance writers. And as our membership increases, the board wants to make sure that everyone is aware of the different levels of membership available, how to qualify for different communities of practice, and how you can benefit from the different networks offered by RWA. First, it’s important to understand that there are two levels of membership within RWA at the national level. General membership is open to all people who are involved in the serious pursuit of a career in romance writing. (We’ll get to the definition of “serious pursuit” in a minute.) General members reap all the benefits of an RWA membership, including the right to vote in our elections, and the ability to run for a position on the board. Everyone else falls into the Associate membership category. This includes writers who cannot prove the serious pursuit of a romance writing career, as well as other industry professionals, such as acquiring editors, publishers, or agents. Associate members enjoy most of the benefits that General members do, but they aren’t allowed to vote or run for office. Multiple complete original works of romance fiction which combine for a total of at least 20,000 words. A few short stories or a novella should suffice. When you’re ready, you can upload your manuscript at the Proof of Serious Pursuit page on National’s website. This will be enough to qualify you for General membership. It will probably also be enough to qualify you for PRO, or maybe even PAN. Provisional: This is for RWA members who are contracted for an as-yet-unreleased romance novel or novella with an advance of at least $1000, or published authors who have not yet earned $1000 on a single title. General: This is for RWA members who have a published, commercially available romance novel or novella for which they have earned at least $1000. The only difference between these two levels is that Provisional PAN members may not participate in the RWA trade-show booth, vote in the PAN elections, or run for PAN office. RWA San Diego has a vibrant published authors community called PALS. Our current PALS Liaison is Jillian Stone, and she organizes fun and informative get-togethers for our published authors. So if you’re an Associate RWA member who qualifies for PAN or PRO, what are you waiting for? Get those applications going and take advantage of all the wonderful opportunities available to you through RWA – both on the national and local levels. Get Pumped for the Literacy Bash! It’s that time again! RWA San Diego will be hosting its annual Literacy Bash on Saturday, November 19th. For those who’ve never attended, it’s a fabulous, fun-filled day filled with big names in the romance industry and a number of opportunity drawings. The proceeds from the event go to supporting some important local literacy nonprofits, such as READ San Diego and the CCA Writers Conference, supporting high school students across the county in their efforts to learn more about creative writing. This year, we’re proud to announce our very special guests for the Literacy Bash: New York Times bestselling author, Julie Kagawa, and her agent, Laurie McLean, founder of Fuse Literary. They’ll be talking about the making of a million-dollar deal, specifically, how they worked together to craft their own million-dollar deal! The big bucks are still out there, and they’re going to give you some insight on how you and your agent can work together to get your own! Laurie represents RWA San Diego’s own Lisa Kessler and Linda Wisdom. In the afternoon, while Julie discusses the ins and outs of writing YA romance, Laurie will be taking pitches. If you’re interested in showing her what you’ve got, be sure to perfect your pitch and sign up for some of the limited spots right away. Laurie is currently closed to unsolicited queries, so this is a fantastic opportunity to get your work in front of her. This is always a popular event, and every year it reliably sells out. Don’t miss out – register today! The first fifty registrants receive a free Julie Kagawa book. Love at the Library returns! Join us at the Riford Library on November 5th to celebrate romance all afternoon! We will have workshops, signings, readings, and ending with a screening of Love Between the Covers, a documentary all about the genre we all love. You can find details on our awesome upcoming event here! In May, we had many of our authors read to new and eager readers, one of them was Mary Galusha. Today, she shares some great ideas for doing a public reading of your book. I was one of the lucky RWASD members whose name was drawn to read from my book at the Love at the Library at the Central Library. I would like to share some of the things that worked for me, and maybe some of this will work for you, too. I had previously done a reading at a book signing at my gym and discovered some ways that made the whole thing more interesting. First of all I found that I am not only selling my book, I’m selling myself. That means I didn’t only read from my book, I did some talking, too. I started by stating my name and the title of my book. I told what the story was about (similar to what the back blurb is) and the names of the two or three main characters. To prepare for this, I selected scenes from the book (my favorites) to read, preferably ones with dialogue. I would recommend at least three scenes, but five would be better and seven would give you more, if you need it. I didn’t start on the first page, I told my listeners what the first scene was about and a little of what had happened before, then I read the scene. The most important thing is to choose scenes that have a hook at the end. A word of caution. Be sure you don’t give away your secrets (the answers to the hooks you have dropped) in the rest of the scenes. Feel free to edit your reading as you go along. It’s important to look up and at your audience from time to time or is this makes you uncomfortable, look over their heads. If you have a dynamite first chapter, by all means read that with gusto. Remember to take your time. The bigger the audience, the slower you should read. They’re your words, cherish them, you worked hard for them. If there are no other questions, you can thank you audience for listening, restate you name and the name of your book, holding it up so they can see the cover. You can add that you will be signing in the lobby. I hope this can be helpful for those who will be reading at our next event. Love at the Library will be happening from 1pm to 6pm on November the 5th at the Riford Library in La Jolla (7555 Draper Ave. La Jolla, Ca. 92037). Hope to see you there! The October meeting was all about how to stay healthy as a writer – both physically and spiritually. Perfectionism. Expectations are one of the biggest blocks to creativity. If you think what you’re writing isn’t good enough, your motivation to write can disappear. How to overcome it? Give yourself permission to “write crap.” Sometimes, Jill says, if you write crap and put it away, when you come back to it later, it might not be as crappy as you thought it was when you wrote it. It could’ve just been the perfectionism whispering in your ear. Comparison. It’s so easy to look at what other writers are accomplishing and say, “I’m not as good as them, and I never will be.” When other people are hitting bestseller lists and you’re still struggling with rejections, it can paralyze your efforts, and make you say, “Why bother?” How to overcome it? Look at what successful people are doing and ask yourself, “What can I learn from them?” You might find yourself being inspired instead of envious. Ultimately, the goal is to rewire your brain to think positively. Instead of saying, “I have to write X words,” or “I should write this next chapter,” tell yourself, “I get to write today!” By viewing it as a privilege as opposed to an obligation, you change the story you tell yourself about your writing. You make it fun again. Another way to change the story in your head is to keep a “Reminder Journal.” According to Jill, it’s an informal collection of thoughts, ideas, and quotes that remind you of why you like to write, and why you started writing in the first place. You can include compliments you’ve received on your writing, positive memories and emotions associated with your writing, tips and tricks that work for your creativity, and good reviews. Every once in a while, take it out and look it over. By doing so, you’ll replace the negative voices in your head with positive ones. The creative process, Jill says, is a romance. When you first fall in love with writing, you become infatuated, just like you do when you fall in love with a person. And like any romance, enthusiasm can wane over time. You need to find a way to remember the initial sparks of excitement in order to stoke the fires of creativity and maintain your enthusiasm over the course of your career. In the afternoon, our own Linda Thomas-Sundstrom spoke to us about caring for our bodies. While we know Linda as a prolific author of twenty-eight romance novels, she’s also a fitness professional who teaches on the faculty of two colleges in the Health, Nutrition, and Exercise Science departments. Without our physical health, we wouldn’t be able to write at all, so one of the most important things we can do for our writing careers is to ensure we’re finding ways to include fitness in our daily lives. Linda provided us with some tips and tricks for incorporating movement into our normally sedentary schedules. At a minimum, you should be getting at least twenty minutes of exercise every single day, at your optimal training heart rate. Which means more than a leisurely stroll. If your heartbeat isn’t speeding up, then you’re not getting a good workout. A brisk, steady walk would suffice, though anything that gets your heart rate up would work – jogging, running, or even just dancing around the room. To avoid long-term damage to your health caused by extended periods of sitting, Linda says it’s crucial to get up from your chair every thirty minutes. Sitting down slows your metabolism and encourages a stooped posture. To combat the effects of slouching over your keyboard, Linda suggests keeping a resistance band next to your computer (I’ve got mine next to me now!). Set a timer for thirty minutes; when it goes off, stand up, walk around, and perform a few arm and shoulder stretches using the band. Just this simple movement, performed consistently, will make a world of difference in your health and posture. Challenge your body to make a change, Linda says, and make conscious decisions to get fit. And if you feel your creativity lagging, go for a walk. You’ll feel more energized and creative after you get some exercise – a flexible body equals a flexible mind. Tessa McFionn’s sci-fi series got picked up by an editor. Cynthia Diamond’s Wyrd Love Books 1-3 boxed set is coming out next week. Bob Richard published Angel’s Eyes. Linda Seed published Fire and Glass, the fourth book in a series. Also, Moonstone Beach was Barnes and Noble’s Free Friday pick. Jeanne Dickson won a number of contests. Eire Ever After placed 3rd in the Sheila and the TARA, and Second Chance Ranch was a semifinalist in the Genesis Contest, and a finalist in Pages From the Heart. Linda Thomas-Sundstrom will release A Wicked Halloween boxed set in October 2016. Next month is our fantabulous annual Literacy Event! Registration opens on November 1st. Sign up early, because this event usually sells out quickly. This year, we’re featuring New York Times bestselling author Julie Kagawa and her agent, Laurie McLean. There’ll be giveaways, pitches, and free books to the first fifty registrants. See you then! Tell us a little about yourself! Who are you? What do you write? The short dull version: My name is R. Ann Siracusa and that’s the name I use when writing. You have to guess what the R stands for. I grew up in southern California (my father was a lawyer and a State Senator), I have a degree in Architecture from UC Berkeley, and I’m retired from a 37-year career as an architect/land use planner (which makes me older than dirt). I’ve been married to the same man for 53 years, and we have three grown children and eight grandchildren, and two great grandchildren. The more interesting version. After graduating from Berkeley, I traveled to Rome to study at the University of Rome. After I found a pensione, I went looking for an American Bar I remembered. I was dying for a hamburger after a week in England. The café I remembered is located on a major street that intersects with Piazza Della Republica. However, there are at least five streets intersecting that piazza. I planned sit down by the fountain in the center of the piazza to figure it out. I didn’t delude myself that it was the actor, but still I skipped across the street and sat next to him. After a while, he started talking to me (heh, heh, heh). He spoke a little English, I spoke a few words in Italian from one semester in college. Despite the communication problem, I learned he was a Guardia of the Pubblica Sicurezza, a state policeman, who worked in the passport office. And when he invited me to dinner, I accepted. Oh, yeah. We found other ways to communicate, as young people usually do. Things got very friendly on the steps of the Palazzo Della Civitá, but it was dark by then—thank goodness— and we were up a million steps from street level, under the arcade. After that, I was smitten. A couple of months later, I had to look up the word fidanzata in my Italian-English dictionary to find out I was engaged, and in December we got married in a civil ceremony. I’ve always liked to read and write stories but, unfortunately, I never considered writing as a career because I wanted to be an architect. In my job I did a lot of non-fiction professional writing, which satisfied me for about twenty years. My biggest regret is that I didn’t follow up on my interest in fiction writing until I was in my forties. At that point I read a romance novel that everyone was raving about and said, “Oh, man. Even I can write better than this.” So I wrote a novel. That’s when I realized writing was my calling, and I’ve considered myself a writer ever since. P.S. My novel wasn’t better, but my feet were on the path. What does RWASD mean to you? Joining RWA was one of the two smartest things I did when I realized I wanted to be a writer. The other was to join a good critique group with a professional writer as our mentor. I’ve been with RWA since the mid-eighties, almost from the beginning. After I retired in 2000, I began to write seriously with the intention of publishing and joined the San Diego Chapter. The group has been for me a never-ending and positive source of support, encouragement, and learning. Without it, I’m sure I never would have been published. RWASD is an integral part of my family whom I love very much. What is the biggest challenge you have faced on your journey to becoming a writer? Finding the time while working and raising a family to write in more than 10 minute segments. From that I learned to always have something with me to work on (so waiting time isn’t wasted) and to write anywhere, including on a train with the old standard of pencil on notebook paper. What attracted you to the genre you write? Why does it speak to you? My genre, until now, has been romantic suspense, and I didn’t pick the genre so much as it picked me. My choice of reading material is eclectic, but I particularly enjoy complex plots and fact moving action stories. While is enjoy a good mooshy love story, am less attracted to novels that focus primarily on the development of the romance. Romantic suspense was the perfect answer. My latest release is a murder mystery, as is the project I’m working on. I’m now into writing mysteries What I really love, and would like to write, is science fiction. Where is the weirdest place or what is the weirdest thing that inspired an idea? I can’t think of anything weird that has inspired me. Everything around us can inspire ideas. I listen to people’s stories and watch “incidents” that take place, particularly when I travel. Sometimes those things bring a story to mind all at once, other times I tuck it away until the right situation and/or characters come along. This isn’t weird, but probably the most dangerous thing I’ve done was driving by myself from Messina, Sicily, to Palermo, over the Peloritani Mountains the other side of the Sicily and back. This was in the mid-eighties, and I’d gone to Sicily to do more research on my historical Mafia novel. I needed to figure out how long it would take my heroine had to drive the distance in the novel, and I wanted to see what the countryside looked like. Who’s a writer you would do backflips to meet and why? Would that I could do a backflip! There are many writers for whom I would flip if that were possible, but it would have to be Katie MacAlister, Janet Evanovich, Don Francis, or Issac Asimov. These writers have inspired me, particularly regarding how to structure and tell the story. Unfortunately, Francis and Asimov are deceased, and I’ve already met Janet E, so I guess it would be Katie.. If you could go back 20 years ago, what advice would you give yourself? In those days (maybe about 30 years ago) all the romance books had to be about school teachers, Nanny’s, nurses, or young women who live with their parents and do nothing. I couldn’t relate to that and wanted to use more professional heroines. Not good. My latest novel, The Last Weekend In October, is an amateur sleuth murder mystery that takes place in Los Angeles in 2004. I always do research before I travel, and when I was planning my trip to Antarctica, I learned a lot about the continent and the scientific research stations there. Fascinating stuff! And I thought,What would happen if someone was murdered at one of the stations in Antarctica when winter was closing in and the station is completely isolated? In this excerpt, Essi (the protagonist) is out on the ice shelf on a snow quad and is being stalked by someone who previously took a shot at him with a rifle. He is trying to distract the stalker so he/she won’t find the heroine who has in her possession critical evidence about the murder. Essi flung himself off the vehicle as it sailed across the ice and plunged into the open maw of the chasm. He followed it a second or two later, heart slamming against his ribcage. The vehicle tumbled end-over-end into the fissure and smashed into the ice. The sound of it hitting the walls and the parts shattering rang in his ears for what seemed a long time but was only seconds. He landed hard on the ice, momentum rolling him over the edge immediately behind the vehicle disappearing into oblivion. Frantically, he dug his gloved fingers into the snow which broke away under pressure, leaving only solid ice. Sliding downward, he found the walls of the chasm were not vertical but sloped sharply, disfigured with a web of ledges and rough projections of ice. Gasping for air, he dug in his boots trying to find purchase. His descent slowed but he couldn’t get a firm grip on anything to halt the thrust. What a stupid way to die! Before you go, any advice to give to the new writers out there? In general, my advice to aspiring authors: Run away from home! Actually, that’s the best piece of advice I can give. Since that may not be possible, here are some practical ideas which nearly every author advocates in one form or another. ▪ Start today. Never think you’re too old or too young. Don’t put it off. The “right time” never comes. ▪ Learn the craft of writing – Know the rules; when you break them, do it on purpose. ▪ Learn to take criticism – It’s no fun, but to learn you have to hear the bad news along with the good. But learn the difference between useful and hurtful criticism. ▪ Finish the damn book and send it out. An Agent Has Offered You Representation… Now What? Well… now what? As much as you might want to jump on their offer with a resounding “YES!” it would behoove you to ask some questions to make sure the agent is a good fit for you and your writing career. We’ve all heard that saying, “A bad agent is worse than no agent.” This is your chance to figure out if this agent is the right choice for you. So, what should you ask them? Do you consider yourself to be editorial, or are you more hands-off? In other words, do they want to help revise your projects before sending them out on submission, or are they planning to send them as-is? Both agenting styles have their pros and cons, so this is really a matter of what you’re more comfortable with, and what you want out of your relationship with your agent. What is your communication style? Find out how the agent prefers to get in touch with you – by phone, over email, etc. – and how often they plan to touch base. Can you tell me about some of your recent deals? Get an idea of who they rep, what kind of work they’re putting out there in the world, who they’re doing business with, and what kinds of contacts they already have. Many times, this information is available on Publishers Marketplace, but if you don’t have a subscription, now’s a good time to ask about it. What is your policy on self-published work? If you plan to self-pub your projects in the future, or are interested in becoming a hybrid author, you should find out their stance on self-published work ahead of time. Will they be involved or supportive? And do they expect a financial cut of your self-published projects? What happens if my book doesn’t sell? Most likely, you’re signing with an agent based off of a single book or series, but there’s always a chance it won’t sell. Now’s a good time to discuss other ideas for future projects, to see if you and the agent share a long-term vision for your future and your career. What about you? What are some things you asked your agent before signing with him/her – or what are some things you wish you’d asked? Today’s blog post is brought to you by RWASD’s own Tessa McFionn! Wow! What an amazing meeting! Our guest speaker, Callie Hutton, gave some wonderful insight about writing historical characters that appeal to today’s readers. Subjects not covered in history books, such as interracial relationships. So much historical facts and research that overwhelm the romantic story. She reminded everyone that historical romance reads are not just for “old people” any longer, but market trends show that most historical readers prefer physical copies to digital media. Next up, Callie was joined by our own Georgie Lee, Regan Walker, and Sorcha Mowbray in an engaging panel discussion about the changes and trends in historical romances. Lisa Kessler did a great job as moderator, keeping things lively and highly entertaining. A good way to keep histories fresh is to think about using modern, social issues as seen through the lens of history. Even though your story and characters are living in the past, you are still world building. So be sure to remember the rules set up by you as well as by history itself. And the Atta Girl went to Lisa Kessler, who persevered through a difficult family trauma and met her writing deadlines. Jackie Leigh Allen released Thirst for Love in July. Mickey Brent received a publisher’s contract for her first novel. Susan Burns had a manuscript request from an agent and editor at TOR. Also, she pitched to agents and Entangled on Savvy Authors. Teresa Carpenter’s newest release, The CEO’s Surprise Family, marks her 20th! Mary Galusha had a book reading and signing at the CURVES luncheon in Escondido. Demi Hungerford released her second book in Regency Banquet Entrée series writing as Roxanna Haley. Lisa Kessler’s Ice Moon is a finalist in both Aspen Gold and NERFA. Harvest Moon won a PRISM for Best Paranormal, which was presented at RWA Nationals. Also, Lure of Obsession released on August 1. Georgie Lee had two releases, Miss Marriane’s Disgrace in August and The Cinderella Governess in September. Also, A Debt Paid in Marriage finaled in National Excellence in Romantic Fiction Awards (NERFA) and Pirate’s Bargain also finaled in Pages From the Heart Contest. Claire Marti got a request from Entangled for her historical synopsis. Tessa McFionn’s Lost in Transmigration took third place in FF&P’s On The Far Side Contest. Also, she had two releases, Detours in Our Destinations in August and Spirit Song in September. Plus, she received a revise and resubmit for Lost in Transmigration. Ann Siracusa released The Last Weekend in October in July. Also, she sold five books in a romantic suspense series. Regan Walker double finaled in Aspen Gold, plus she finaled in The Carla, Ancient Cities Hearts of Excellence, Las Vegas I Heart Indie and the RONE Awards. Our next meeting will be Saturday, October 15 to hear Jill Badonsky talk on Six Ways to Keep Inspiration Flowing and our own Linda Thomas-Sundstrom will give us Tips and Tricks to Keep your Body Healthy as a Writer. We will also be holding our Annual General Meeting where the new board will be announced. Don’t forget to vote and see you in October! The RWASD Blog features articles by members of the RWA San Diego Chapter, as well as published RWA members from across the country. We hope you enjoy our blogs and chapter news. The opinions expressed by the Bloggers and those providing comments are theirs alone, and do not reflect the opinions or policies of RWA San Diego or its members. RWA San Diego is not responsible for the accuracy of any of the information supplied by the Bloggers.